Three years after its release, Portal 2 still proves to be one of the more popular games on Steam. Fans keep the experience fresh through submitting user-designed test chambers, and more gamers are experiencing the game for the first time thanks to Our Lord Gabe Newell’s many Steam Sales. Those who have played the game for a while, however, are by now used to the formula: shoot blue portal here, shoot orange portal there, fly across the room and reach the exit. Those days are over now. Last week, the user-created Portal 2 mod Aperture Tag: The Paint Gun Testing Initiative, became available on Steam. The mod, created by Eugenio “Motanum” Roman, adds a unique and fun new challenge to the diabolical and dangerous test chambers of Aperture Science. That new challenge comes in the form of your unnamed protagonist’s weapon. It is not the usual Aperture Science Handheld Portal Device, but rather a new gun that is capable of spraying surfaces with the blue Repulsion Gel and orange Propulsion Gel introduced in Portal 2. Inspired by the student game Tag: The Power of Paint (which inspired the gel mechanics in Portal 2 in the first place), players will need to solve test chambers by bouncing up walls and over gaps, as well as jettisoning off ramps and past deadly spikes. A new energy field grill makes an appearance in the mod; walking through it will force you to have access to one, both, or neither of the gels for a specific part of each test chamber. Other testing elements from the Portal series make a return, including cubes and buttons, floor switches, lasers, and turrets. Portals themselves also appear, but as secondary elements activated by buttons and switches. The test chambers are very well designed, and gradually increase in difficulty much in the same way test chambers in the original Portal games do. I was able to quickly solve most of the earlier puzzles but began scratching my head frequently on the final leg of the game. I admit I had to consult a walkthrough a few times for the last few test chambers, having a few “ah-ha!” moments upon doing so. This is about the same experience I had playing the first Portal and Portal 2, so to me Motanum was spot-on with designing the perfect learning curve. You even get to re-visit a couple test chambers from the first few games, and are encouraged to solve them not with the Portal Gun, but with your Paint Gun. These levels were crucial to helping the player understand the new mechanics, and were a lot of fun to play. The scenery is also incredible, expanding on the vast depths of Aperture Science that were first greatly explored in the original Portal 2. 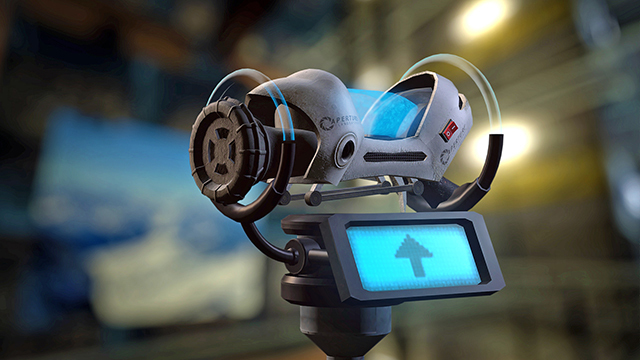 Unlike in the main games, where Chell takes an enclosed elevator to the next test chamber, in Aperture Tag the player travels via vacuum tube. Vacuum tube travel was severely underutilized in Portal 2, and it’s great to see the element used to its fullest here: through the clear tubes you see everything. You soar over the old 1950s testing spheres, through walls, over catwalks and between the many rooms of the evil science facility. 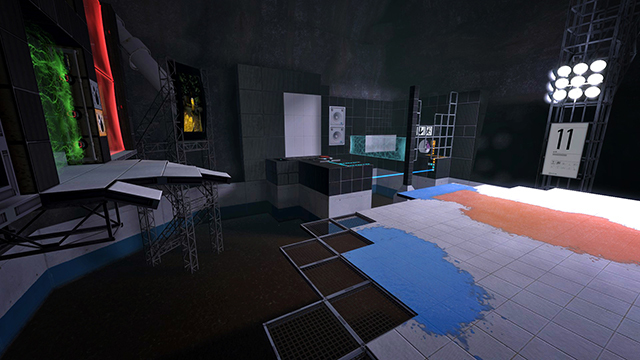 Later in the game, Motanum took some creative liberties that surprisingly fit well inside Aperture: the final test chambers are themed to different environments, from pine forest to ocean, desert to space. Real as they look sometimes, a few missing wall panels remind you that the environment you’re traveling through is artificial, a product of the diabolic minds running Aperture. Unfortunately, the story of Aperture Tag does not live up to its full potential. A new personality sphere named Nigel (smashing?) escorts you through the tests. And, well… That’s all I can say about the story, really. Not because of spoilers or anything. Nigel simply has no personality to him. The voice actor sounds rather dull, and we don’t know anything about Nigel’s personality aside from how he wants to follow Aperture’s “protocol” with test subjects. 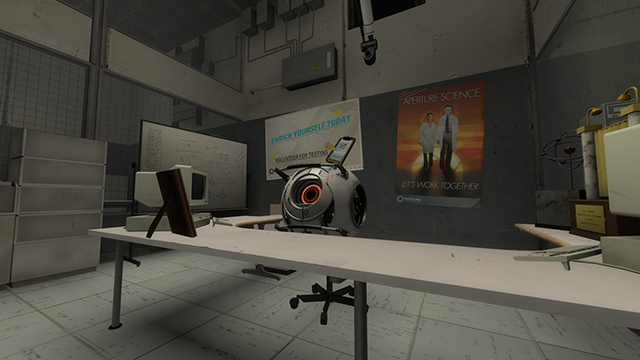 It is clear Motanum attempted to make another GLaDOS or Wheatley for the player to enjoy, but poor writing and character development makes Nigel the least interesting part of the game. But a bland story that makes a couple cake references shouldn’t stop a Portal fan from trying out Aperture Tag. If you’re tired of solving puzzles with the Portal Gun, you really should take the Paint Gun for a spin. It shakes up the Portal formula just enough to get you scratching your head again. FINAL VERDICT: If you plan on checking out Aperture Tag, don’t do it for the story or you won’t be impressed. Play the game if you’re looking for a set of expertly designed test chambers that take a secondary game mechanic from Portal 2 and make it your primary mechanic, offering a whole new way to make science happen.